Java is a programming language (originally developed by Sun, now managed by Oracle), used to create web applications, desktop applications and applets. In order to run Java desktop applications, or Java applets, you need to have a Java Runtime Environment (JRE) and/or Java Plugin, installed on your computer. If you are running Windows, getting the JRE and Plugin, is very easy. 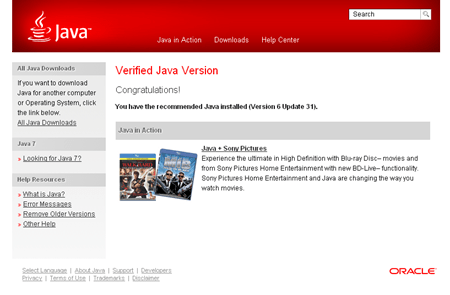 To install Java, simply go to www.java.com, and click on the Free Java Download button. Clicking this button will check your system to see if you have Java installed, and if so, check which version is installed. If you don’t have java installed, or you have an older version, you will prompted to install the latest version. Alternatively, if you would like to have more control of the installation, or to find out more about Java, you can go to the Java website: www.oracle.com/technetwork/java/javase/overview/index.html. Once you have Java installed, you will be able to access many cool applets on the web, and run Java based applications on your computer.